NyQuillKY has released patches for other mods that have new arrows. He's also working on the Dragonborn DLC arrows. Be sure to check it out! A re-release of Palistov's Archery - Spinning Arrows mod. 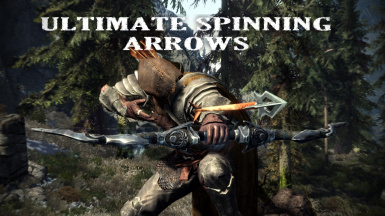 As the title suggests, this mod makes arrows (and bolts if you have Dawnguard DLC installed) spin mid flight. Most noticeable on kill cams. The mod has been reorganized so that it will work with any mod, even with ones that modifies arrows. The plugins have been removed, and the meshes are now loose files and no longer archived in BSA format. This is because the original mod uses an ESP plugin, which is technically unnecessary for mesh replacements which will automatically override vanilla meshes when put into the correct folder paths. Installation can be done via any mod manager like NMM or Wrye Bash. Manual installation is done by manually extracting the files to the appropriate folders. This mod supports Closer Quivers and Longer Arrows and Immersive Weapons. Dawnguard compatibility are already included in both download options and Immersive Weapons patch is available. I highly recommend uninstalling via Nexus Mod Manager, unless you want to reinstall Closer Quivers and Longer Arrows as this mod replaces the arrow projectile meshes for the Closer Quivers and Longer Arrows Version. This mod does not use plugins. Should work with everything except mods that adds new arrow meshes unsupported by this mod yet. Although any mods that use vanilla arrow assets will work.